I wish my doctor had asked me about the types of leisure activities I enjoy and/or my favorite ways to reduce stress before he shared the tumor board’s recommendation of a mastectomy. My clinical options and ultimate decision wouldn’t have changed, but I would have felt like my surgeon and oncologist were concerned about the long term and overall impacts of the treatment to my quality of life. Although whole health and wellness is the goal for both physicians and patients, we occasionally seem disconnected from—or even at odds with—each other. A health care provider’s best intentions can be crushed by time constraints. A patient’s desire to be well can get lost in the mix of misunderstanding. What do you wish your health care provider did, said, asked or heard? What do you wish patients knew to ask about? Knowledge is power. It wouldn’t take much for my kids’ pediatrician to send us a health questionnaire ahead of time or for my oncologist to ask me about my leisure activities. They want what’s best for my health, too. In an effort to help provide context, improve understanding, generate empathy, and drive a change in behaviors between physician and patient, let’s make these wishes visible. 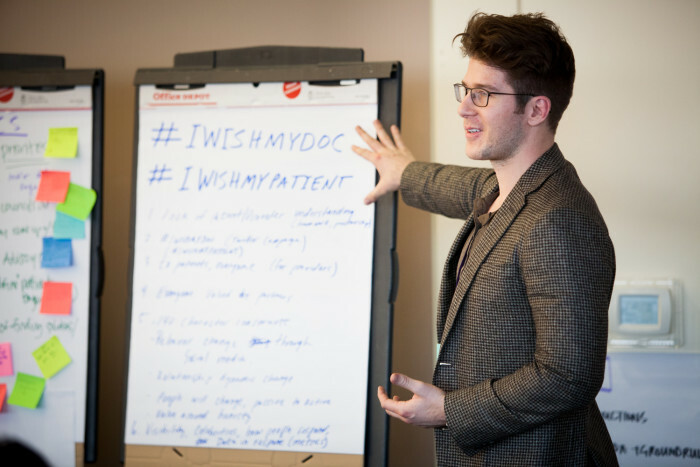 In the month of February, with the hashtags, #IWishMyDoc and #IWishMyPatient, we can start a respectful conversation, aimed at bridging the gap between patient and physician, with health, wellness, and shared understanding at the center. Thanks to the power of social media, we are not constrained by official survey requirements, insurance provider policies or geographic location. And, perhaps most exciting, there is no HIPAA stranglehold over sharing suggestions. Everyone can participate and everyone can learn. Patients, physicians, family members, surgeons, nurses, caretakers, phlebotomists—anyone who sees a patient under the auspices of healthcare or is themselves a patient of patient support—what are your wishes? #IWishMyDoc had puzzles in the oncology waiting room. Would be a wonderful distraction. #IWishMyDoc sent me a “How Are You?” email in between my 6month check-ups. Opens door for questions. #IWishMyPatient would leverage phone appointments more often. Originally, this idea was focused on a hashtag campaign via Twitter. However, if your “wishes” don’t fit snuggly into 140 Twitter characters, try Facebook, Instagram or one of the many other platforms that my preteen & teen have surely not taught me about yet! When you tag your entry with #IWishMyDoc or #IWishMyPatient, we can collate responses and share back with the greater population at the end of the month.